Hurray For The Riff Raff's Alynda Lee Segarra during NPR Music's annual SXSW showcase, held at Stubb's BBQ in Austin, Texas. "I'm ready for the world," Alynda Lee Segarra sings in the chorus of the rousing "Hungry Ghost" — and her band's set told that simple truth again and again. In the past seven or eight years, Hurray For The Riff Raff has blossomed slowly but fully, transforming its sound from intense-but-delicate one-woman bedroom recordings to the rip-roaring full-band jams that dominated the group's set at Stubb's BBQ in Austin, Texas, recorded live for NPR Music Wednesday night. 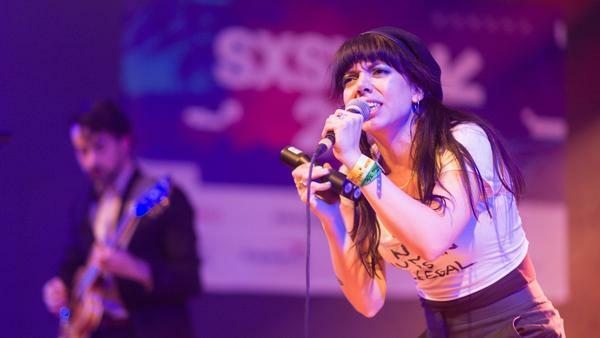 Segarra commanded rapt attention throughout a string of powerful songs from Hurray For The Riff Raff's new album The Navigator, which examines her Puerto Rican heritage and a search for what she calls "my lost humanity." Wearing a homemade T-shirt that read "No Human Is Illegal," Segarra roared through songs that seethed with coiled intensity — even the slow-burning ballad "Fourteen Floors," for which Segarra took over on keyboards, was performed with to-the-skies power. So, yeah: Ready for the world.